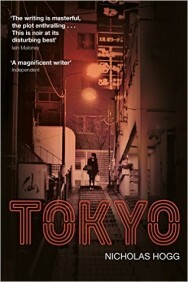 Longlisted for the Guardian’s Not the Booker Prize, Tokyo takes us deep into the heart of the city and into Nicholas Hogg’s rich storytelling. MAZZY LOOKED DOWN onto moonlit clouds. No break in the feather bed cumulus laid out from LA to Tokyo. There had been one shining moment, when a streak of silver glittered on the surface of the sea, like a sheet of worked metal. Then again the cloudscape, the anger at being pulled from a Californian high school to Japan, her father. So she looked to the perfect moon, craters and scars from ancient collisions. Lonely in the thoughts of a lifeless rock, she turned back to the plane and the sleeping passengers. Some comfort in the other bodies. The Japanese man beside her was in his mid-twenties. Hard to tell with skin that even toned and smooth. He was sleeping. Or his eyes were simply closed. Mazzy would have to wake him to excuse herself past to go to the bathroom. It seemed a shame to disturb his peace, the Buddha-like repose. The faint lines at the corner of his mouth were the only hints of ageing, and the more she looked the more immaculate he seemed to appear. Five hours into a transpacific flight his black shirt was barely creased, and not a strand of his thick dark hair out of place. Still, she wasn’t holding it in across the width of the Pacific. He didn’t even seem to be breathing, let alone waking to allow her past. She had to reach over and touch his arm. He opened his eyes and stared, as if she were some precious creature stepped from his dream. “I need the bathroom,” said Mazzy, pointing down the plane. Slowly, the man nodded. Though rather to approve some private thought than to acknowledge her presence. Again, she said she had to use the bathroom. This time he smiled and stood, bowing a polite apology as she squeezed out from the seats. Mazzy walked past the slumbering passengers. Slurred faces before the glowing screens. She didn’t see how he watched her walk the darkened aisle, the way she tied back her long blonde hair. She took her time in the cubicle. Washed her hands and studied her eyes. Her father’s daughter, she knew that much. His high, stern, forehead, a serious focus to her resting features. But the wide smile breaking out across her cheeks when needed. When she got back to her seat the Japanese man was looking out of the window. Sitting in her place. His face almost pressed to the glass. Now she noticed marks under his jaw, a bruise or graze running under his left ear. He shifted over then stepped into the aisle, so Mazzy could move past. “It’s beautiful on the clouds,” she said, sliding back to her place. Before she began the inevitable small talk on who was going where and why, he asked her if she knew the Japanese folk tale about a moon princess. Whether the man took this as an invitation to tell seemed unimportant. He had to tell. He sat straight and erect, spoke. Nicholas Hogg was nominated for the IMPAC literary award for his début novel, Show Me the Sky. Winner of the New Writing Ventures prize for fiction, and numerous short story contests, his work has also been broadcast by the BBC. His third novel, Tokyo, was published summer 2015. 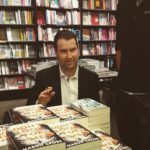 He is vice-captain of The Authors Cricket Club, a team of cricket playing writers published by Bloomsbury.